After unearthing clues pointing them toward the legacy of a mysterious prophet, the heroes of Numeria must brave a remote canyon known as the Scar of the Spider, where they hope to uncover ancient knowledge to aid them in defeating the sinister Iron God of the Silver Mount. But the heroes aren’t the first visitors to the distant valley—alien monstrosities from the darkest reaches of space have colonized the canyon, and hold their own horrific agendas. Can the heroes escape with their brains intact, or will they become the latest additions to a sinister, otherworldly collection? 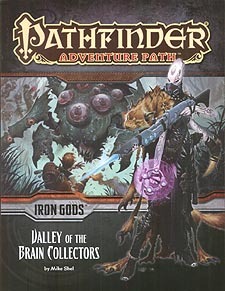 "Valley of the Brain Collectors," a Pathfinder adventure for 10th-level characters, by Mike Shel. A treatise on the galaxy-spanning horrors known as the Dominion of the Black, by Mike Shel. A study of the technology used by four alien cultures, by David Schwartz. A hero's solemn return home in the Pathfinder's Journal, by Amber E. Scott. Four horrendous new monsters, by Mike Shel.